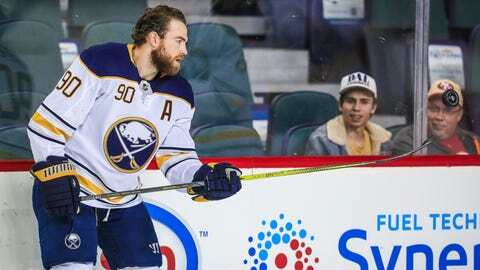 Ryan O'Reilly has scored 422 points over 651 career games with Colorado and Buffalo. A trade to the St. Louis Blues has O’Reilly excited about hockey and the future after three consecutive losing seasons with the Buffalo Sabres had him talking about losing his love for the game. Now the 27-year-old center is itching to get back on the ice and help the Blues reach the playoffs, even if that adventure doesn’t begin in earnest for a couple of months. O’Reilly said on Buffalo’s locker cleanout day that the Sabres had adopted a mentality of “being OK with losing” and he believed it crept into their game. He stood by those comments Monday, thanked Buffalo and expressed happiness at moving on to start what he hopes will be a winning chapter of his life. When the Avalanche traded O’Reilly to the Sabres at the 2015 draft and he signed a $52.5 million, seven-year contract, the expectation was to be the central figure. With St. Louis, he joins an already-established core of Brayden Schenn, Jaden Schwartz, Vladimir Tarasenko, Colton Parayko and captain Alex Pietrangelo. O’Reilly joins a Blues team that missed the playoffs by one victory and already bulked up in free agency by signing center Tyler Bozak, winger David Perron and backup goaltender Chad Johnson. St. Louis acquired O’Reilly from Buffalo for young forward Tage Thompson, a top-10 protected 2019 first-round pick, a 2021 second-round pick and forwards Vladimir Sobotka and Patrik Berglund. St. Louis general manager Doug Armstrong hopes a change of scenery benefits O’Reilly, who put up between 55 and 65 points in each of the past four seasons. O’Reilly hopes his rapport with coach Mike Yeo, Schenn, Schwartz, Parayko and defenseman Joel Edmundson from playing together with Canada at the world championships eases his transition. With the spring tournament filling the void of the postseason, he’s eager to take part in the Stanley Cup playoffs for just the third time.